With hours of finger painting and story time, preschool may seem like it’s all fun and games, but researchers say it’s arguably the most critical year in a child’s life. 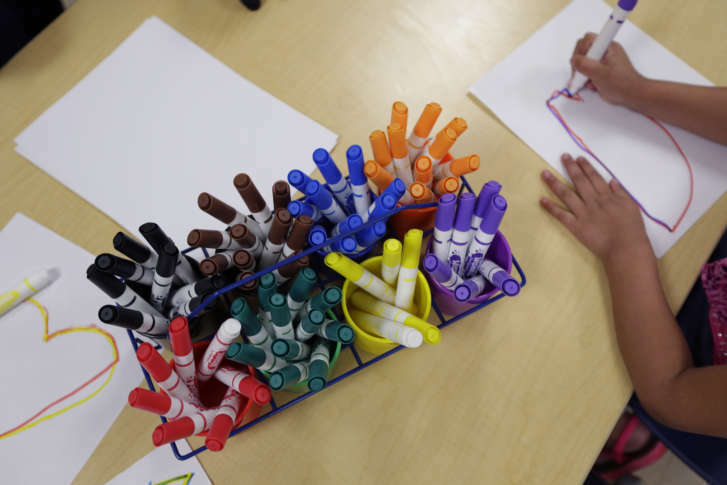 WASHINGTON — With hours of finger painting and story time, preschool may seem like it’s all fun and games, but researchers say it’s arguably the most critical year in a child’s life. Research shows that children enrolled in preschool are less likely to be held back a grade or need special education services. Beyond that, kids who attend a high-quality pre-K program are more likely to be high income earners and avoid trouble with the law. But only about two-thirds of the nation’s 4-year-olds are enrolled in pre-K programs. Those who aren’t have a number of factors to blame. Unlike K-12 education, Bouffard said there’s a “huge variety” in the availability and quality of pre-K programs across states, and even within states, since there is no single and consistent source of funding for early education. Forty-three states, plus the District of Columbia, fund public preschool programs through state funding or grants; Idaho, Montana, Wyoming, North Dakota, South Dakota, Utah and Mississippi do not. But just because these states offer pre-K programs, doesn’t mean there’s room for every child to attend. Many publicly funded pre-K spots operate on a lottery system. In states without pre-K, most affluent families can afford private preschool, and children in lower economic brackets are eligible for programs such as Head Start. It’s kids in the middle, however, who are left behind. “There’s a group of families in the middle who are really financially squeezed and who don’t have access to programs they can afford. And about 2 million American adults are sacrificing career and other life decisions because they can’t afford early education and child care programs for their children,” Bouffard said. It’s not all doom and gloom in the realm of early childhood education. According to the National Institute for Early Education Research, state funding for preschool rose 8 percent in 2016, and state funding per child increased to $4,976. Bouffard said not only is investing in pre-K programs a good move for the future of children, it’s a wise business decision for the country. She cites research that suggests for every dollar invested in pre-K programs, the U.S. can save between $3 and $10 in the long-run. The work of Nobel-prize winning economist James Heckman shows that every dollar spent on high-quality early childhood education programs for disadvantaged children delivers a 13 percent per annum return on investment. “Society saves money and also saves stress and difficulty,” Bouffard said. Preschool expansion is on the rise, but Bouffard cautions that with this growth, quality needs to be considered alongside access. “I was worried that we may be [expanding] without paying enough attention to quality. And that if we do that, we’re really going to be shooting ourselves in the foot and harming young children in the long run,” she said. There are a number of model pre-K programs out there, including one at D.C.’s Powell Elementary, which Bouffard writes about in her book. Boston is another city prioritizing quality pre-K. Both examples invest in support for teachers and play-based learning, among a number of other standards. Bouffard said her primary motivator for writing “The Most Important Year” was to highlight quality curricula, so parents can choose good programs for their children, or advocate for them if they are unavailable. “I know — not only as a professional, but as a parent myself — how confusing and overwhelming it can be to navigate this world and find a good program for your family,” Bouffard said.